Here is the list of best free word guessing games for Windows. These guess the word games are entertaining and challenging at the same time. The objective of these word games is same, i.e. to form meaningful words. Some of these word games use pictures as their questions, some use jumbled letters as questions, whereas some word games use other interesting concepts. These free word guessing games are good for all age groups and help you boost your vocabulary. These games come with many interesting and interactive options, keeping you hooked to them. 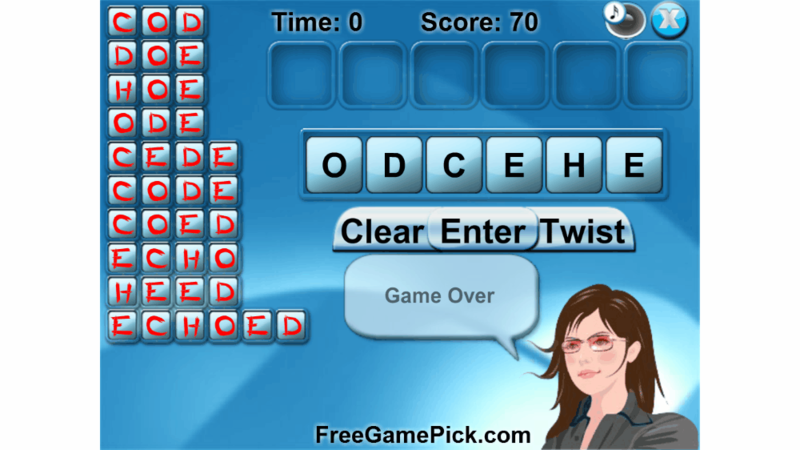 Explore the following list to know more about the gameplay of these free word guessing games. Find Word: This is a simple and addictive word guessing game. Test how good your vocabulary is by playing this game. You are given a word and you have to form as many words as you can from that word. As simple as that. Emoji Game: If you like to chat and use Emojis, then I am pretty sure that you will love this word game. As the name indicates, this word game uses emojis in the form of questions. Use combination of emojis as clue to solve word puzzles. Go through the list and install the word game that you like the most. You may also like the list of 100 Best Free Board Games and 30 Best Free Maze Games. 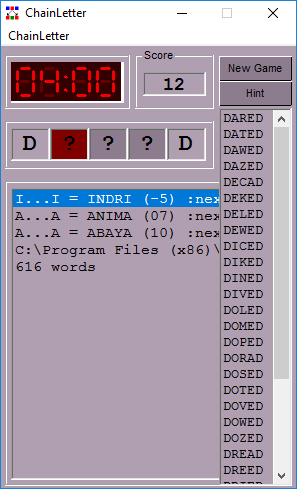 Find Word is an interesting word game guessing for Windows. In this game, you are given a word with any number of letters. Your aim is to form the maximum possible word combinations by the letters of the given word, within a given time. For example, from a word Computer, you can form copter, court, temp, etc. Any word with less than 3 letters is not allowed. The number of correct and incorrect words formed by you will be shown on the screen. This is a very enjoyable guess the word game. This word game is also good for kids, as it helps to enhance their vocabulary. Bundester is one of the best free word guessing games for Windows. It is very interesting guess the word game in which a picture is hidden behind blocks, and your aim is to reveal the picture by forming all valid words from a given string of letters. Every time you form a new word, some blocks will be removed and a part of the picture will become visible. The interface of this game is animated, so making this game more exciting to play. It helps you boost your vocabulary in a funny and entertaining way. The concept of this free word game is simple. A list of incomplete words with blanks is displayed on your screen. You have to complete the words by forming correct words from the given string of jumbled alphabets. When you form a meaningful word, hit enter button provided on the interface. If you get stuck in this game, you can use hints or shuffle the given letters. You can use hints up to 3 times only. Your current level, score, and number of remaining hints are also displayed on the screen. You can save your game, so that you can continue playing it later. How many words can you form from a given list of jumbled letters? Can you form all the valid words? 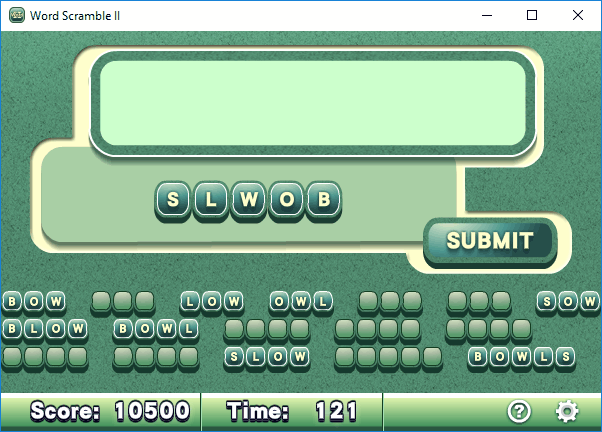 Presenting Word Scramble II, a very interesting guessing word game for Windows. This guessing game is very easy to understand and play. It displays some jumbled letters in front of you and you have to form the maximum number of possible word combinations. On each correct word formation, you will be rewarded some points. You can share your score on social media after completing a level. 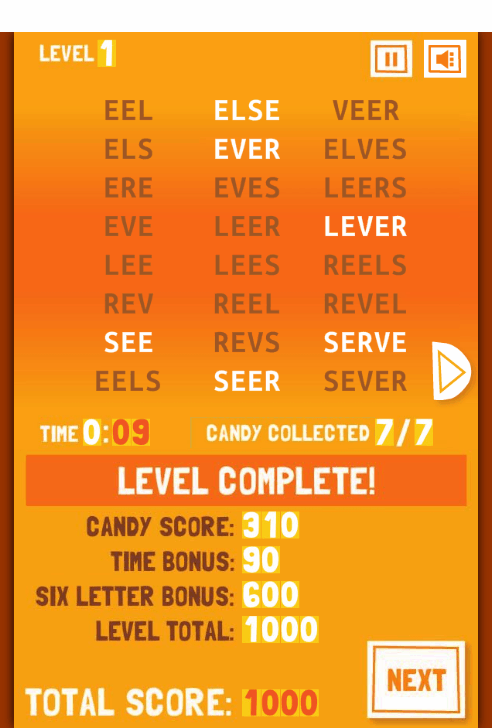 There is a certain time limit for each level and you have to guess as many words as you can within the given time. When the time is over, your final score is displayed on the screen and the remaining words that can be formed will also be displayed. This will help you enhance your vocabulary. Teaches new words in a playful manner. Install this amazing word game on your PC and put your vocabulary to test. NOTE: You should have Adobe AIR installed on your PC in order to play this game. Whirl Words is one of the challenging word guessing games for PC. In this game, you will be given a list. In this list, the top and bottom rows will have different words and the rows in between will be empty. Your aim is to complete that list with valid words as per instructions. The instructions can be any, like adding or removing one letter, scrambling, etc. For example, if SNOW is the first word and you will be told to form next word by removing any one letter, then you can form any possible word by jumbling the rest of the letters, like: now, won, etc. Sounds interesting? This game is ideal for all age groups. It may take some time to understand how to play this word guessing game, but once you are familiar, this game will become very interesting and addictive. This freeware comes with 133 challenging levels. As you proceed to the higher levels, the game will become more complicated. You can take only one hint in each level. Install this interesting game and know how strong your vocabulary is? Word Guru is another interesting word game for Windows. The objective of this word game is same as discussed in previous word games. Form as many word combinations from a string of letters as you can. If you get stuck in this game, you can shuffle the jumbled letters by clicking Twist button. While playing, keep an eye on running timer, as you don’t have enough time to solve a puzzle. At the end of each level, all the possible words that can be formed from given jumbled letters will be displayed on your screen. I liked the scoring scheme of this game. The marks rewarded to you will be in multiples of 10, i.e. if you form a word of 4 letters, you will get 4 x 10 = 40 points and so on. Your game will be over if you are unable to form any word from the jumbled letters. Lots of interesting levels to play. Comes with two animated characters (male and female). You can select any of them in Select Character menu. Chainletter is a very interesting and challenging guess the word game in this list of free word guessing games for PC. This is a straightforward game in which you have to form words that start and end with the same letter as given by the computer. Form as many words as you can within 5 minutes. For every correct answer, you will get some points which you can use for taking hints. But to take hints, you must have minimum 10 points. Every time you take hints, some points from your total score will be deducted. So, try to use your brain instead of hints. This is a logical word game for Windows, that is suitable for all ages. Download and play it now. Mind Your Word is a free guess the word game that is just like a very popular game: Master Mind. Your aim is to find correct four lettered word that matches exactly to a hidden word. You will have to make a guess within the minimum number of trials and time. For every word, it displays two types of dots: Black and White. White dot indicates that the letter is not a part of the hidden word, whereas black dot represents that the letter you have chosen, not only correctly matches the hidden word but also have been placed at the right place. Try to guess the secret word within the minimum possible guesses. It is totally based on hit and trial method. It supports multiple languages. Some of these are: Dutch, English, French, German, Italian, Latin, Spanish, etc. Word2Letters is a simple, easy, and interesting guess the word game for PC in which you have to form maximum valid words of length varying from 4 to 9 letters within the given time. The maximum number of possible words of each letter that can be formed are given in the game. First 2 letters are given in each new game. Use these letters to form words. To do this, just type the letters and press enter when done. Word2Letters comes with 2 playing modes: Timer and Without Timer. Timer Mode: In this mode, you have to form as many words as you can within a given time. Scores will be given as per the length of words you form. 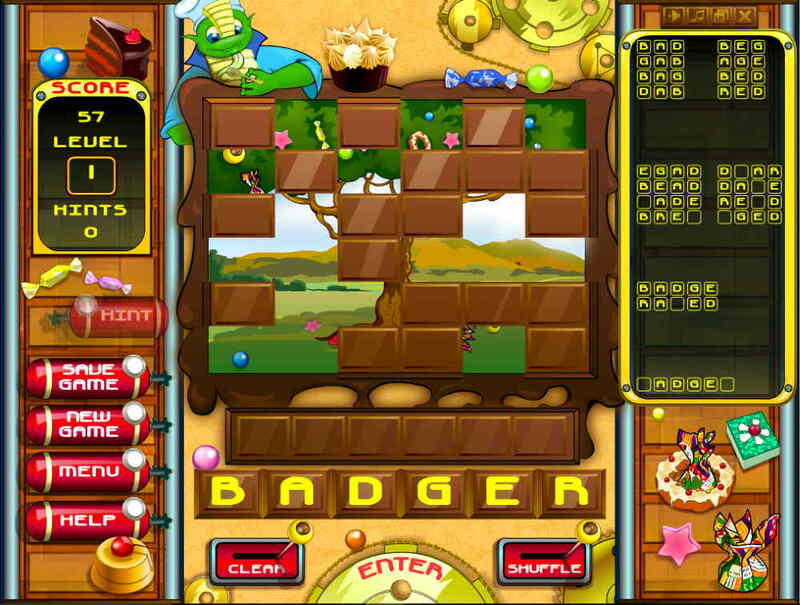 Without Timer Mode: There is no time limit in this gaming mode. Test your vocab in this playing mode. Remember, no points will be rewarded in this gaming mode. You can start a new game anytime by clicking New Word, but this will terminate your current game and all the progress will be lost. You can also take hints, but every hint costs some points and you should have at least 10 points to take a hint. When the time is over, you will get your final score. Click Show Words to view all possible word combinations, but this will terminate your current game. Its built-in dictionary lets you know the meaning of all the words. It comes with more than 20 color schemes. As the name implies, in this free word guessing game, you have to fit letters in blank spaces within a word in order to complete it. The possible number of word combinations that can be made are displayed. Every new game comes with 100-word quizzes. You have to answer each quiz correctly in order to score high. The number of words you guessed and points rewarded to you for that word are displayed. To complete a word, place correct letters in the blank spaces and click Try button. If you don’t know the correct answer, you can skip a question. Download this very simple and interesting word guessing game for Windows, Cut and Paste. This game is based on the concept of cut and paste. Your aim is to form new words from the given strings of jumbled letters. Two columns of blocks are displayed in which one column contains all the blocks filled with letters, while the other column has some empty blocks. Just click on any letter in first column and put it into the second one, so that a meaningful word could be formed. Usually the word guessing games have less number of puzzles, but this one comes with more than 900 puzzles. You can switch to any puzzle randomly. You can save your current game. You can also print any puzzle by saving it in PDF format. It also lets you copy the whole puzzle and its solution to clipboard; however, this feature did not work for me. Guess Cartoon Picture is a free word guessing game for Windows. This Windows 10 app is one of the favorite guessing games for kids, as it contains quizzes based on cartoon characters. Playing this game, Kids can learn to spell words correctly. It comes with 5 gameplay levels, and each level has multiple guess the word games. Only the first level is unlocked and rest four are locked. The first level of this game has 40 puzzles to play with. Solve these puzzles to unlock next level and so on. The concept of this word guess game is very simple; an image of a cartoon character is displayed on the screen and you have to identify it by answering its correct name. To do this, select the correct letters from the provided list of jumbled letters. You will receive 400 coins for the first time you launch the game. You can increase these coins in number by giving a correct answer to every question. For every correct answer, 40 coins will be awarded to you. You can also earn 350 coins up to 5 times sharing this app on Social Media. Moreover, 120 free coins will also be awarded to you, if you watch video ads. If you don’t know the correct name of the cartoon character displayed on your screen, you can use hints provided in this free word game. But remember, every hint costs some coins. If you don’t want to spend your earned coins on hints, you can share that question with your friends on Facebook. This free guess the word game comes with in-app purchases, in which you can purchase coins. It supports more than 10 languages. Some of these are English (United States), Bahasa Melayu (Malaysia), Deutsch (Deutschland), Espanol, Francais (France), Portugues (Portugal), etc. If you are sure that you will solve these puzzles easily, then think again, as it is not as easy as it sounds. Most of the cartoon characters that it contains are not well know characters. NOTE: This game contains Ads. Download Animal Quiz, a guess the word game that lets your kids learn animal names with fun. This Windows 10 app comes with a good collection of quizzes based on animals. These quizzes help your kids remembering animal names. The concept of this free word game is very simple. An animal image is displayed on the screen and you have to name it by selecting the correct letters from a string of jumbled letters displayed on the screen. For every correct answer, 40 coins will be rewarded to you. 400 free coins will be awarded to every new user for the first time. Besides this, you can also earn free coins sharing this app and watching video ads provided in this guess it game. You can use these coins for taking hints. Hints in the game are categorized into three different types, and each hint costs certain coins, for example: Remove letters hint removes all unnecessary letters from the jumbled letters list. This hint costs 80 coins. Hence, it is suggested to you to use coins wisely. A decent amount of free coins will be provided. Like Guess Cartoon Picture, it also supports multiple languages. This guess the word game is really helpful for kids to learn animal names. Get it now! 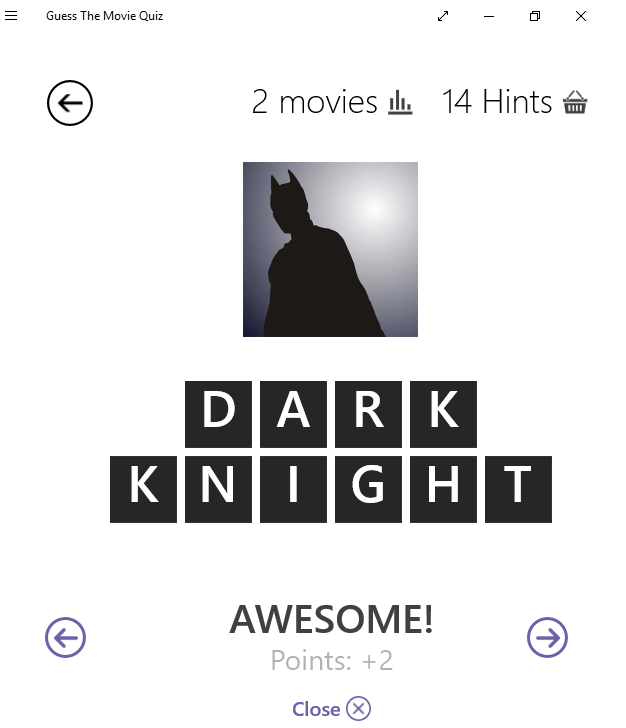 Guess The Movie Quiz is an interesting guess the word game for Windows. This Windows 10 app is a game that you will definitely like. In this free guessing game, an image related to a certain movie is displayed on the screen and you have to name it by selecting the correct letters from jumbled letters list. It comes with 20 exciting levels, and each level contains more than 10 movie images. Initially, all the levels except first three are locked. You need to guess the name of certain movies correctly to unlock rest levels. This number is different for each unlocked level. 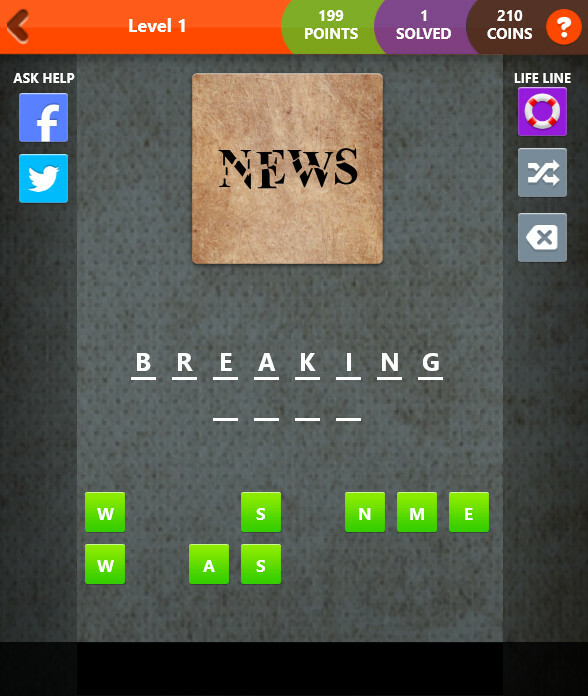 If you are unable to guess the correct name, you can use hints provided in this game. But there are only a limited number of hints. So, use them wisely. Unlike Animal Quiz, you will get a few free hints by sharing this app on social media. However, one free hint will be awarded on answering every 3 movies correctly. In addition, you will also receive some points for every correct answer. Emoji Game is one of the best free word guessing games for Windows. This Windows 10 app is based on Emojis, and is a good time killer. It displays different Emojis and you have to form a correct word by using these images as hints. For example, from the above emoji combination, word Sunglasses is formed. Now click on the above picture, it will open another picture with such emoji combination. Can you guess the word? If yes, comment below. For every correct answer, you will be rewarded 40 coins. You can use hints by spending these coins. As you proceed further, the difficulty level starts increasing and the puzzles will become more complicated. This game comes from the developers of Guess Cartoon Picture, that I have mentioned above. 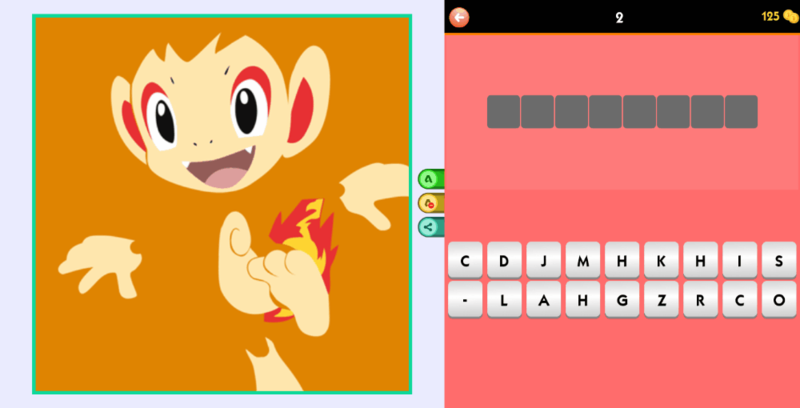 Play Pokemon Character Quiz and catch’em all. This Windows 10 app is a very good word game for Pokemon lovers. This game comes with a lot of images of Pokemon characters. The objective of this game is to identify and name a Pokemon correctly by viewing them. From the jumbled letters, select and arrange letters to form a Pokemon’s name. For every correct answer, you will get 4 coins. If you don’t know the correct name of the Pokemon displayed on the screen, you can take hints provided in the game. But remember, each hint costs some coins. You can also share a question with your friend on social media for help. So, how many Pokemon can you catch? 4 Pics 2 Words is another interesting word guessing game for PC. The concept of this Windows 10 app game is similar to Emoji Game. 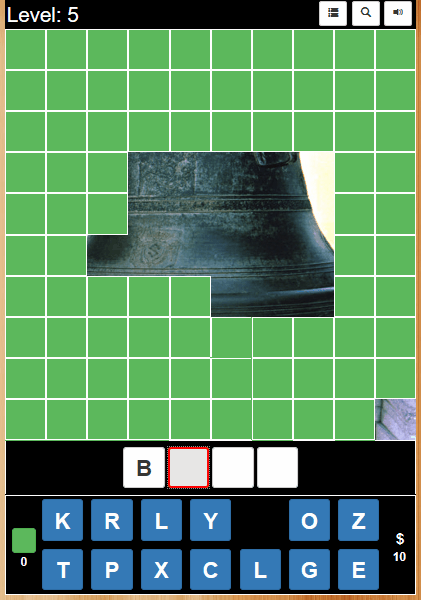 In this game, 2 pairs of images are displayed on the screen and you have to form two correct words by using these images as clues. For example, for a word School bus, the game displays two images of school and other two of bus. This word game sounds so easy, but as you go to higher levels, it will become more difficult. For every correct answer, you will get 10 points. You can use these points for taking hints in the game. Initially, you will have no coins, but you can increase them up to 250 in number for free by submitting a review. On the home screen of this game, you can view a brief summary of your performance, like: current level, total number of coins, etc. As the name indicates, in this Windows 10 app called Guess Picture, you have to guess what is in a picture. Initially, the whole picture is hidden behind tiles. Remove the tiles to view that picture, but you can remove only a few tiles. After that, you have to guess that picture and answer it by selecting correct letters from jumbled letters. Every correct answer will reward you 10 Dollar coins. You will receive 30 Dollars when you launch the game for the first time. These coins can be used to take hints. As hints cost more coins, therefore I suggest you solve a puzzle without using hints. This is a very interesting word game for computer and I am sure that you will definitely enjoy this game. WordPlant is an amazing word guessing game for Windows. The interface of this Windows 10 app is different from all the word games in this list. Your aim is to form meaningful words from letters as fast as you can. Suppose, you are working in a manufacturing unit and you have to make products from raw materials provided. The same concept is applied in this word guessing game. 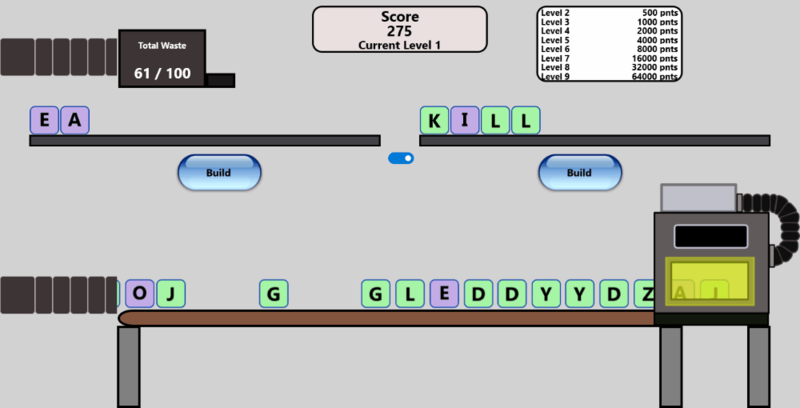 Here a machine releases raw materials (alphabets) on a conveyor and you have to form meaningful words by picking appropriate letters and placing them in the blank space provided. The letters that reach the end of the conveyor are counted as waste. The number of waste letters are also counted. Your game will be over when the waste reaches 100. So, you need to use as many alphabets as you can to make words. At higher levels, the speed of conveyor belt will become fast. This makes word formation difficult. Word Boggle Ruzzle is one of the best free guessing games. It is a Windows 10 app, where your aim is to form maximum word combinations from the given string of letters within given time. Every time you form a meaningful word, you will get one candy. At the end of a level, all the possible word combinations will be displayed along with your total score. Unlike other word games in this list, Word Scramble Search has a little twist. In each level, it is necessary to reach the required target, otherwise, your game will be over. This word guessing game is good for all age groups and is highly beneficial for kids. It comes with lots of levels. The difficulty of this game increases as you move towards higher levels. I think this is one of the best ways to improve one’s vocabulary. 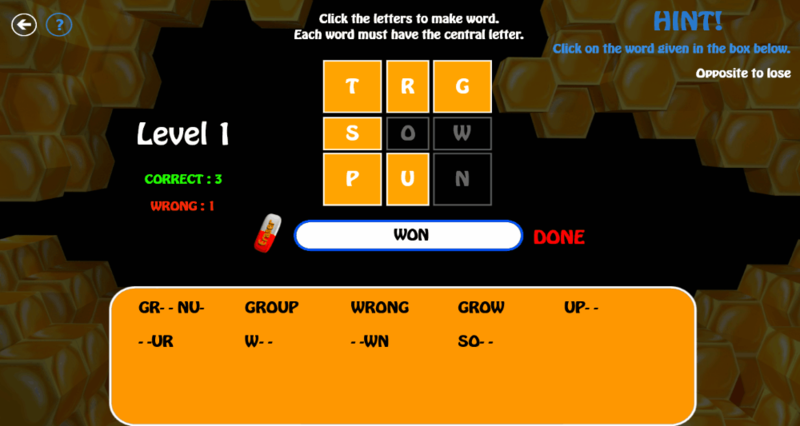 Spell In Bee is an interesting word guessing game for people with strong vocabulary. This Windows 10 game app comes with synonyms, antonyms, riddles, and more. Some words will be displayed with blank spaces. Your task is to complete those words within a minimum number of moves by selecting the correct letters from a given matrix. You can take a hint to form each word and every hint is presented in a different way. For example, for the word Lawn, the hint is “I increase the beauty of your house”. After the completion of a level, the total number of moves (including correct and incorrect answers) will be displayed on your screen. The scoring technique is a bit different and considers both right and wrong answers submitted. Wuzzles is a very interesting word game app for Windows 10 PC. It is an interesting word guessing game. An image is displayed, whose answer is hidden. The answer may be an idiom, phrase, a simple saying, or a compound word. Use that image as a clue and answer it correctly. This is a very challenging word puzzle. For your convenience, few puzzles are solved for you. You can view them to understand this game. On completion of each level, you will get 10 points and a maximum of three stars. Stars will be rewarded, according to your performance in a level. You will receive 200 coins for launching the game for first time. Three lifelines are available in the game. You can use them if you get stuck anywhere. But remember, each lifeline costs some coins. If you don’t want to spend your hard earned coins, you can ask the same question to your friends via Facebook or Twitter. You can see your rank in the leaderboard of this game by connecting it with your Social Media account. It comes with In-App purchases where you can purchase coins.